European Space Agency astronaut Frank De Winne, Expedition 21 commander, works in the Harmony node of the International Space Station in August 2009. Belgian astronaut Frank De Winne has taken the helm of theInternational Space Station (ISS) Saturday, becoming the first European ever tocommand the $100 billion orbiting laboratory. De Winne, 48, of the European Space Agency, officiallytook charge of the orbiting laboratory's Expedition 21 mission after thelast commander, Russian cosmonaut Gennady Padalka, departed on a Russian Soyuzspacecraft headed for Earth. Until now, all station commanders have been eitherAmerican or Russian. "I've always been proud to be European," De Winnesaid Tuesday during an in-space press conference. "Europeans, of course,have a big heritage as explorers. It?s a big honor for me to be the firstEuropean commander of the International Space Station." De Winne launched to the station in May 2009, making hissecond trip into space. He is due to spend a total of about six months inorbit. Padalka landedin Kazakhstan Sunday along with departing Expedition 20 flight engineerMike Barratt of NASA, and Canadian space tourist GuyLaliberte. "Gennady, you have been a great example for me,"De Winne said during a change-of-command ceremony before Padalka left thestation. "It was a pleasure to serve under you and you will forever be anexample in my life." 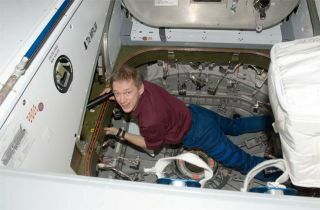 De Winne is now leading a crew of six spaceflyers, includingCanadian Space Agency astronaut Robert Thirsk, Russian cosmonauts RomanRomanenko and Maxim Suraev, and NASA astronauts Nicole Stott and Jeff Williams.They are only the second six-person team to serve on the station, which until thisyear hosted crews of two or three. "[De Winne] is the right guy for the job,"Williams said Tuesday. "I think he's going to be very effective as thecommander of Expedition 21 and already has proven so." Williams is set to take over command when De Winne departsthe station in early December. De Winne is due to oversee a number of milestones during histenure as commander, including the release of the Japaneseunmanned cargo ship HTV-1 - the first of its kind - that arrived at thestation in September. "Hopefully we will get a very successful HTV mission,which so far has been extremely successful," De Winne said. "It showsthat the international cooperation and the international partnership on ISS isworking well." The space station has been under construction since 1998 andis the product of cooperation among 16 partner countries. During De Winne's term, the station will see the arrival ofa new Russian compartment for the - the Mini Research Module 2 - which willserve as an extra airlock and docking port. The station crew will also host moreastronauts when the space shuttle Atlantis arrives in November to deliver vitalsupplies and spare parts.